Yesterday, Capitulative Breadth moved up to 5 from 2 (with 7-10 historically marking bottoms for stocks). The percentage of Dax stocks above the 50MA is zero, making for an oversold extreme. Down pressure for US stocks has reached a historic extreme, which has previously led to significant bounces within a couple of days. 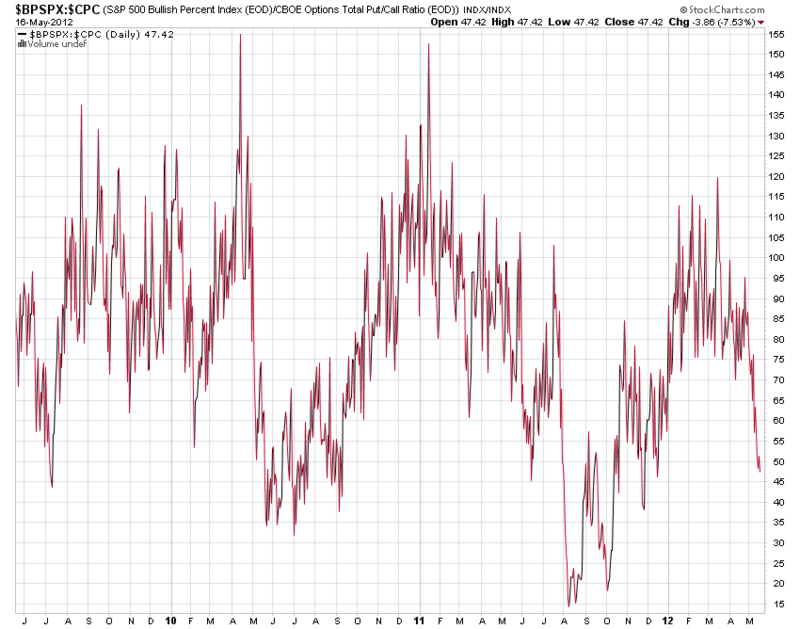 SP500 bullish percent over put/call ratio is down at the levels of the 2009 and 2010 corrections, but not as deep as 2011. The message is the same: a bottom or a bounce should be close. I reiterate my expectation that leading into and around this weekend’s new moon upward pressure should emerge. So I foresee a bounce lasting into the middle of next week, and thereafter we shall see. This weekend is also a solar eclipse, and it gives rise to a subsquent Puetz crash window, June 4 – June 13. Puetz crash windows I have previously found to be hit and miss, but wanted to put it on the radar. With a rerun of the Greek elections scheduled for June 17, some Greek citizens withdrawing deposits from banks, and Euro CDSs still climbing, there is clearly fuel for fear to overwhelm the markets. Based on recent history though, governments and central banks will intervene in any significant escalation, supporting markets. If the situation in Europe is again diffused, then positive leading indicators and a further tick up in economic surprises will likely return the fore, fuelling a period of mean reversion for pro-risk away from oversold and overbearish extremes, and out of the safe havens of treasuries and the dollar. Gold finally reversed today as everyone is talking about how George Soros quadrupled his positions in Gold, but Silver is still mixed… personally I see any bounce here as a short-lived bull-trap (at least price-wise, time-wise we could be in a sideways pattern for a few weeks) and lower prices still lie ahead (we still need an Elliott 5th wave down for the movement to be complete). On the other hand, would you take some anonymous small investor’s word for it instead of a billionaire’s?Well, the Soros exited his Gold positions in the 1st quarter of 2011 and missed out on the eventual price spike that came in September 2011 so the least we could say is that his timing isn’t right. On the other hand, well, the man made billions investing so it’s pretty hard to argue with that lol I guess time will tell who was right and who was wrong. Crashes are extremely rare so treat this appropriately. What crashes that do occur are frequently around one of the two eclipse pairs that occur each year. There is a solar eclipse on May 20, and a lunar eclipse on Jun 4 this year. The basic pattern if it happens is the market will top on or around a new moon. The Nasdaq topped on Mar 27th, the new moon was on Mar22 – the 2000 dotcom bubble topped one week after the new moon. Step 2 is a decline into the next new moon which was Apr 21. The Nasdaque gapped down and bottomed on Mon the 23rd as the 21st was a Sat.Then the market is suppose to have a weak rally to the next full moon which was May 12. The rally lasted only until May 1 – the 1929 weak rally was less than two weeks as well. Then the market falls to the next new moon which is May 20th and a new moon solar eclipse. Then the final low occurs on the full moon which is Jun 4 and also a lunar eclipse. Jun 4th is the Eclipse (Full Moon), Jun 6 is the transit of Venus, and Jun 12th is the Bradley model bottom. Yes it is very unlikely that we are in the early part of a crash. We are in the 13th day of the drop from the initial recovery. The 1987 crash took 17 days from the secondary recovery and the 1929 crash took 24 days. Jun 4 is 25 days from the secondary recovery. Unlikely, but 1929, 1987, and the Nasdaq Composite of recent weeks are eerily similar fractals. The really bad part of a crash happpens from oversold conditions. Kent, I like your analysis. It coincides with some new info I was looking into today. We could be currently in a wave 3, to end today or within a few days, then the positive energy of the lunar eclipse on June 4 could take us up to wave 4 (into possibly June 5/6) then down into the Bradley turn date June 10-12 to end wave A. Then we head up into wave B into early July. I was thinking early July 3-9 could be a trough, but it looks like it will be more of a crest. Then we could be getting wave C down. So there is definitely more selling coming, it’s just a matter of time…. Thx Karen Another way of saying the same thing. Your market price structure forecast seems very carefully thought over many different aspects and conditions forthcoming. My experience is to buy when everyone has been a bear for long time and oversold extremes seen. For example, I read yesterday on 321gold that sprott physical silver premium investors paid over spot price was between 2-3%. There are rare days for the similar conditions. Hence, I take the other side whether right or wrong. From the same experience, I have noticed that initially investors are usually skeptical and it would seem like price would bounce and go back down slashing support, but with some good news it then continues up or consolidates for the next larger gain in price. So, having this in my heart, I anticipate the same for silver. On the market outlook, I have read and analyzed a scenario where there will be a greater high in April 2013 (4 years from March 2009) and a bear market for 1.5 years. Volatile markets for a year after April 2013 and silver could make a high in March/April 2014 and then get sold off along with general market to bottom in 2015. Since it’s a scenario involving future, I will just trade it for the better part of it on different timeframes and not expecting it to materialize fully. In the meanwhile, let’s get busy picking cheap assets for upcoming sharp and vicious rally! Talking about extreme negative sentiment….I am expecting to get some (small qty) shares of Facebook and my wife asked me last night if we should call our broker to cancel because she read so much negative stuff online pointing to the demise of Facebook…a sentence to death even before the IPO. Wow! We shall see. 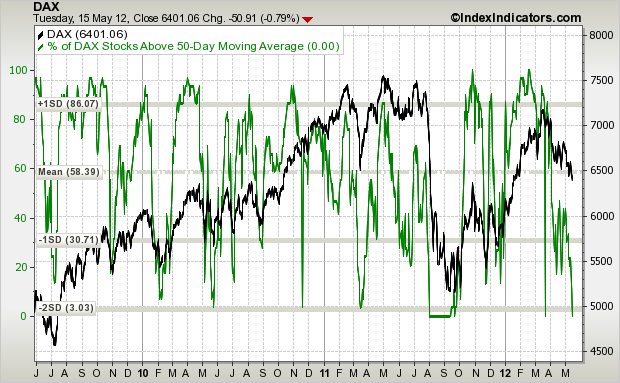 Breadth indicators have yet to get below Aug 2011’….so more selling is dead ahead. My less risky QE3 play of choice ….MBS. Nasdaq RSI under 30, Facebook IPO tomorrow which I expect to be a positive for the market, an intial flurry, hence my long. How FB sustains after that we shall see. Good stuff John. I have put on some currencies trades and plan on building into them, in particular a long US dollar position against both the Yen and the Canadian dollar. While these pairs are usually not correlated as they both are proxies for different risk environments, they have correlated in the past and I believe they will do so again. I am also looking at short-term plays on both the euro and Australian dollar, long against USD. I suspect a rebound over the next week or so especially on any good news out of Europe since CoT data (though delayed) shows everyone and their mother getting short the euro — party like its 1999? I like silver and gold as well here and adding to my physical positions – more silver than gold. Added to Silver and Gold ETFs yesterday. If today’s rally fades and it goes lower I will continue scaling in at lower levels. Will sell into any equity rallies using a short ETF. Hey Edwin. Your wife is probably right in the medium to long term (6 months out or more say…) but in the short term she is best used as a contrarian signal to maybe buy like John is. However, new highs are most unlikely for US stock markets. We are topping here and smart investors should be listening to the tape. 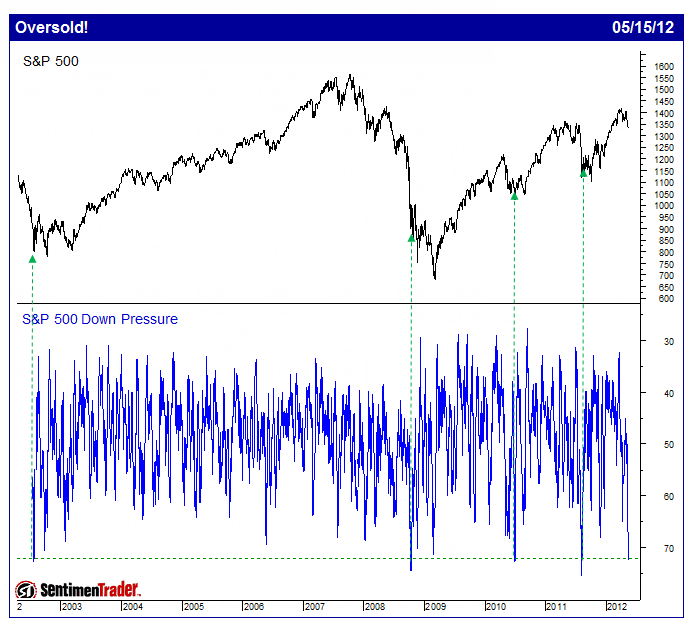 So many assets failed to exceed May 2011 highs and confirm S&P 500’s new high into 1420, which shows a broad topping process from march 2009 lows. MSCI World index did not make a new high, Crude Oil did not make a new high, Copper did not make a new high, Australian Dollar did not make a new high, Euro did not make a new high, Canadian Dollar did not make a new high, Tornoto Stock Exchange ETF did not make a new high, Nikkei did not make a new high, Emerging Markets did not make a new high, European markets did not make a new high, Semiconductors did not make a new high etc etc etc… you can go on forever! When I shorted Apple at $620 it was the top. I wrote about it on this blog back several weeks ago. Now I think Nasdaq 100’s breakout above May 2011, which was not confirmed by Russel 2000 nor Semiconductors, is going to be a HUGE bull trap. With the Dollar rising, international earnings for US companies are actually shrinking due to the exchange rate. That will make revenues smaller. At the same time, the world is slowing down meaningfully, includes the economies of Chi-ndia which accounts for 4 billion people on this planet! I’ve been slowly turning bearish but now I’m turning super bearish on everything. The world might even end this time around haha! But, from the short term, I’d buy the S&P 500 for a rally I guess.